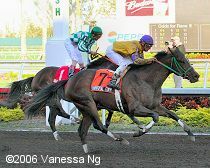 Only 7,670 fans came out to Gulfstream Park in Florida for the Grade 1 Donn Handicap and the five undercard stakes. Steady rainfall through the day rendered the track a sloppy mess and all turf races were moved to the main track. The $500,000 Donn featured a field of nine older horses going 1 1/8 miles on the main track. Suave was sent off as the 2-1 favorite over 4-1 second choice Magna Graduate. 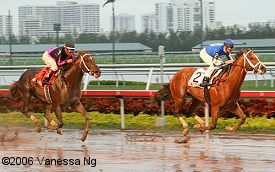 The three-horse entry of Pie's Prospect, Andromeda's Hero, and Seek Gold shared third favoritism with Super Frolic at 9-2. 5-1 shot On Thin Ice was quickest out of the gate and was joined on the clubhouse turn by Suave through an initial quarter in 23.10, with Magna Graduate pressing the pace in third. On Thin Ice dropped out of contention on the backstretch as Magna Graduate inherited the lead through a half in 45.82 and 3/4 in 1:09.40, with Suave continuing to contest the lead. Rounding the far turn, jockey Willie Martinez and 8-1 shot Brass Hat, who had trailed the field early, came out wide and closed on the leaders early in the stretch. Brass Hat took over the lead at the 3/16 pole and drew away to win by 4 3/4 lengths over another closer, Pies Prospect, in a time of 1:47.49 for the 1 1/8 miles over the sloppy going. It was 3 1/4 lengths back to Andromeda's Hero in third. Favored Suave faded to sixth. Brass Hat in the winner's circle. Winning trainer Buff Bradley said, "The rain did not concern me at all. This horse will run over anything. He could run up I-95 or go run in the snow. I was glad to see the strong pace, and when he got to third, I felt pretty confident. I told my dad (owner Fred Bradley), 'We got it now.' I can�t describe this. It�s a dream for my Dad, for me and for everyone whose been involved with this horse. He�s done really well up in Turfway. My wife took care of him on our little farm. She took care of him during his recuperation period." Bradley said that Brass Hat may start next in the Dubai World Cup or at Oaklawn. 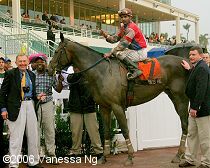 Winning jockey Willie Martinez said, "We really didn�t want to do anything to change our horse�s style (off-the-pace). We had a lot of respect for those other horses, but I don�t think they had a lot of respect for us. I told Buff (Bradley) last year that this horse would be even better this year, and I think he is. We appreciate this horse and the style he has." There were two stakes races on the undercard with Triple Crown implications. 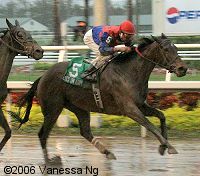 The Grade 3 Holy Bull saw twelve 3-year-old colts travel 1 1/8 miles on the main track for a $150,000 purse. 9-1 shot Doctor Decherd set the early pace of 23.18 and 46.28 over the sloppy going, with 8-5 favorite Barbaro giving chase. 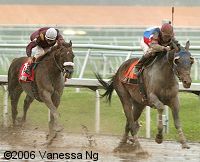 Rounding the far turn, Doctor Decherd began to fall from contention as Barbaro interited the lead. With a furlong to go, he looked home free with a 1 1/2 length advantage, but in the final 1/16 of a mile he held off the late charge of 25-1 longshot Great Point to win by 3/4 length in a time of 1:49.31. It was 2 1/2 lengths back to 11-1 shot Golden Song, who was 1/2 a length ahead of 4-1 second choice Flashy Bull in fourth. Barbaro splashes through the mud as he returns after the race. Winning trainer Michael Matz said, "Edgar (Prado) said he handled it fine (track). He told me he had a lot of horse under him. When he saw the lights (at finish line), he switched leads, but he was never in trouble. God willing, he comes out of the race good, and since we�re here in Florida, I suppose we�ll look at either the Fountain of Youth or the Florida Derby, or possibly both. We�ll let him tell us." The Grade 2 Hutcheson featured a field of 7 three-year-olds sprinting 7 1/2 furlongs around one turn of the main track, also for a $150,000 purse. As expected, First Samurai was sent off as the 3-5 favorite, with Keyed Entry the 5-2 second choice. Keyed Entry got the jump on the favorite out of the gate, and angled to the inside setting a brisk pace of 22.19 and 44.10 down the backstretch, with First Samural staying a length back. Through the lane, Edgar Prado asked First Samurai for his run, but Keyed Entry was able to hold him off, winning by 1 1/4 lengths in gate-to-wire fashion. It was 16 lengths back to 20-1 shoy Express News in third. The final time was 1:27.12. Keyed Entry in the winner's circle. 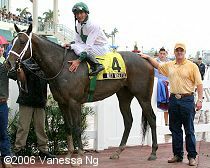 Winning trainer Todd Pletcher said, "I was very pleased. This horse has been training exceptionally well since he got down here. 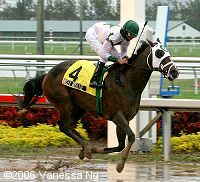 Obviously it�s a big step up to go from an �a other than� (allowance) to run against a Grade I winner like First Samurai. The plan now is to gradually stretch him out. Whether or not we go in the Fountain of Youth (Mar. 4), or somewhere else, I�ll have to get him back and decide that later." 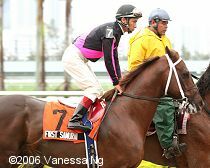 Frank Brothers, trainer of beaten favorite First Samurai said, "I thought he ran well. That was a top class horse (Keyed Entry) that he was running with, and you can�t take anything away from him, but I thought my horse ran well for his first start off the bench in three months. The track condition didn�t hurt the top two. I know that. He was sharp. He just couldn�t get to that other horse. We�re going to stretch him out. I�d like to get 1 1/16 mile (race), but you don�t always get what you want in this game. 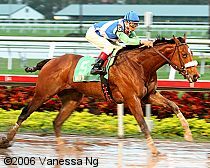 I expect that he�ll have another start at Gulfstream, but that�s not set in stone." The Grade 2 Davona Dale Stakes is the local Oaks prep, with 7 three-year-old fillies going 1 1/8 miles for a $150,000 purse. 7-2 third choice Wait a While stalked the pace of 8-1 shot Stolen Prayer through a half in 45.70, before taking over in upper stretch and drawing off to a commanding 14-length win over 2-1 favorite Teammate in a time of 1:50.27. It was a 3-horse photo for second, as Teammate, 5-2 second choice Wonder Lady Anne L, and 8-1 shot Stolen Prayer were just heads apart to round out the top four. Wait a While in the winner's circle. Winning jockey John Velazquez said, "I didn�t think she was ever going to get into the gate, but once I got off of her, she went right in. After that, all I was worried about was getting a good position. She broke fine, and when I got her in position, everything went great." Trainer Todd Pletcher added that Wait a While will start next in the Bonnie Miss on March 5. The female component of the Hutcheson is the Grade 3 Old Hat Stakes at 6 1/2 furlongs on the main track. Six 3-year-old fillies went to the gate in this $100,000 event. 5-1 fourth choice Misty Rosette took over the lead after a half in 44.16, then drew away to win by 4 lengths over 6-1 Swap Fliparoo in a time of 1:16.03. 9-5 favorite Yachats failed to fire, finishing fourth. 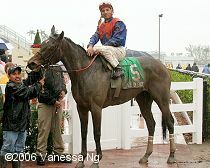 Misty Rosette in the winner's circle. Winning trainer James Chapman said, "She�s been running like this all along. We haven�t even asked her to open up yet. If we want her to win around two turns, she needs to be doing things the way she�s doing them now. Our goal with her is to make the Kentucky Oaks. We�ll sit down and see the schedule and see where we go from here. I wasn�t worried about her on this track, because she�s bigger and stronger than most 3-year-old fillies right now." The $100,000 Suwannee River Handicap for older fillies and mares was originally a Grade 3 event at 1 1/8 miles on the turf, but was moved to the main track and downgraded to listed status. Only five distaffers faced the starter as seven scratched out of the race. 6-5 favorite Eyes on Eddy settled in fourth early on, then rallied at the top of the stretch to open up a 4 length lead with a furlong to go. In deep stretch she held off the late charge of 5-2 second choice Tattinger Rose to win by just 1/2 a length in a time of 1:49.56. It was 9 3/4 lengths back to 9-2 third choice Marchonin in third. Eyes on Eddy in the wet winner's circle. 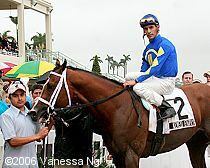 Winning jockey Rafael Bejarano said, "My horse broke good, but I wanted to try and stay behind early. 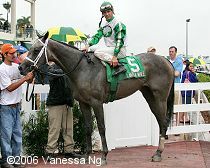 When that other horse (Marchonin) moved a little early, I had to go because I wanted to stay clear on the outside of him, but then that other horse came on the outside of me (Taittinger Rose), so I just tried to keep my horse going between them." 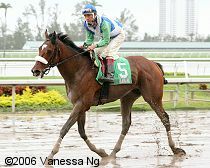 Trainer Paul McGee said that Eyes on Eddy will start next in the Grade 2 Rampart Handicap on March 25. 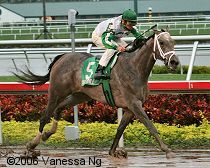 The stakes action at Gulfstream continued on Sunday, as a field of seven older horses sprinted 6 1/2 furlongs in the Grade 3 Deputy Minister Stakes. In contrast to Saturday, the skies were clear. 9-10 favorite War Front contested the early pace with 5-2 second choice Friendly Island through quick fractions of 21.69 and 44.02 over the drying-out track labelled "good". 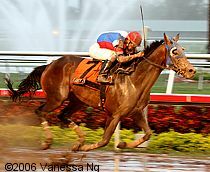 However, the speed duel would be costly as 53-1 longest shot Universal Form, unhurried at the back of the pack down the backstretch, came out three wide on the turn and closed well through the lane to defeat War Front by a length in a time of 1:16.48. It was 4 lengths back to 6-1 shot Judiths Wild Rush in third, while Friendly Island faded to sixth. 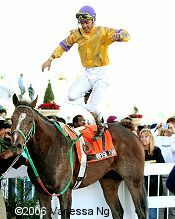 Jockey Manny Cruz makes a flying dismount from Universal Form in the winner's circle. Winning trainer Elliston Rolle said, "This is the biggest race that I�ve ever won. The jockey rode a great race. He�s (Universal Form) a pro at this distance, the (fast) pace helped us, and all those elements helped him. He�s gotten better with age. Manny Cruz fits him because he�s a stubborn horse. He wants to be urged more than a finesse jockey gives you. He needs a couple of smacks out there. We�re just going to enjoy this one for now."